I'm happy to share with you a very exciting new project, the making of my NEW ALBUM - 'Music Box, a Journey Through Childhood'. This album celebrates a vast array of vibrant musical languages, styles, moods and sketches in a journey through different countries and epoques. This audio/CD is the first part of a two part project, the second of which will include animation. As the eternal child which lives in every one of us, it has come to me to embrace and share the beauty of the innocence, inner knowledge and joys of childhood, as well as the soft nostalgia of looking back to it as an adult through this special combination of music for piano. This joy isn't always light and happy. It is the joy of all the spectrums of life, that is always here to behold, to dream and to imagine. I grew up listening to and playing much of this music, so it played a part in forming who I am today, not only in the musical world, but also in the world of story and imagination. Coming back to it makes it even more special for me, and in this time I have discovered some works to be hardly known at all, and am very excited to present them to the public. Something that makes this so personal to me, is that one of the works I will be recording is my own father Vladislav Shoot's Children's Album for piano, which has been with me throughout my childhood, and has never previously been recorded. All the pieces in this album revolve in some way around childhood. Some were written to be played by children, and some were not, but all are dedicated or inspired by childhood. I feel that the journey of this album is like a circle, somehow alegoric to the life journey and the sense of return. It starts with Debussy's great Children's corner, and ends with no less great of a work by coming back to the inner childhood realms from the adult perspective in the unique language of Schumann's 'Scenes from Childhood'. Inbetween , it celebrates many vibrant and contrasting musical islands. ~Recording venue - The Menuhin Hall-The first time I was blessed to meet and play to Yehudi Menuhin I was 6 years old, I then studied and lived at his school until the age of 15, a place of many childhood memories. In order to make this project come to life, I need to raise £8900. I already have a pledge of support from M.P. Belaieff Music Publishers and future plans of a special concert for donors and friends. This is the basic cost to cover hall hire, piano, recording engineers, post production and CD manufacture. The album will be released on iTunes, Apple Music and all other major streaming platforms, as well as CD. Any amount exceeding this will be invested in additional video production and the second part of this project which is a set of Animations to go with these works. and the published music of Vladislav Shoot Kinderalbum for piano, in Belaieff's edition. If you would like to recieve the rewards please specify your address. It is possible on your request to change gifts accordingly. If you would like to contribute without a reward, please signify in a comment or message. If you feel you cannot donate to this financially but would like to help in another way, I would love to hear from you. Please do share this with your friends, and anyone who you think may be interested to be a part of this! Thank you so much for reading, for your participation and presence. I was born in Moscow, Russia, to a musical family and moved to England when my father was invited as composer-in-residence at Dartington Hall, when I was 5 years old. My mother is an artist, whose pictures are created from withered and fallen flowers of these beautiful grounds. I grew up in this beautiful paradise surrounding me, and Russian fairytales of wonder and home, that inspired my fascniation and imagination. Music has always been for me a central part of my life, within it I find the most genuine form of expression through which the soul is immortal and transcends the superficial barriers of time. Music is the language of the heart. 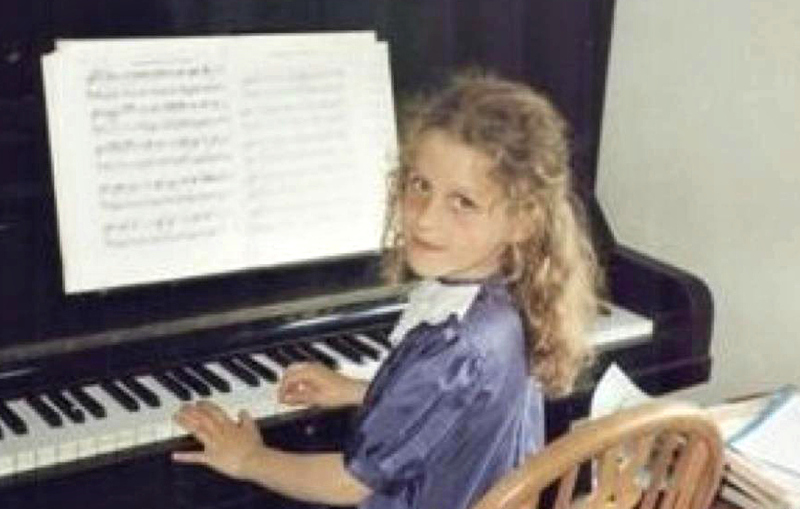 I started piano at the age of 5, and studied at the Yehudi Menuhin and Purcell Schools of music as well as Royal Academy of Music and Royal Scottish Conservatoire. I love to share this music-making with people, as it is the language understood by all mankind, and all living creatures. I love working with children, whose immediate heartfelt response and hunger for learning are; I feel, the hope for the harmonising heart and future of the World we live in. Music is a means of elevating the soul to its true calling, whether we listen to it, or make it. I love collaborations celebrating the different forms of art, and merging them as one expression. I find Yoga to be a way of living in awareness and expansion that goes hand in hand with musicmaking and the arts. This special combination of works unexpectedly revealed to me its educational value, bringing to light a broad scope of children's music, to introduce and work with as a set. 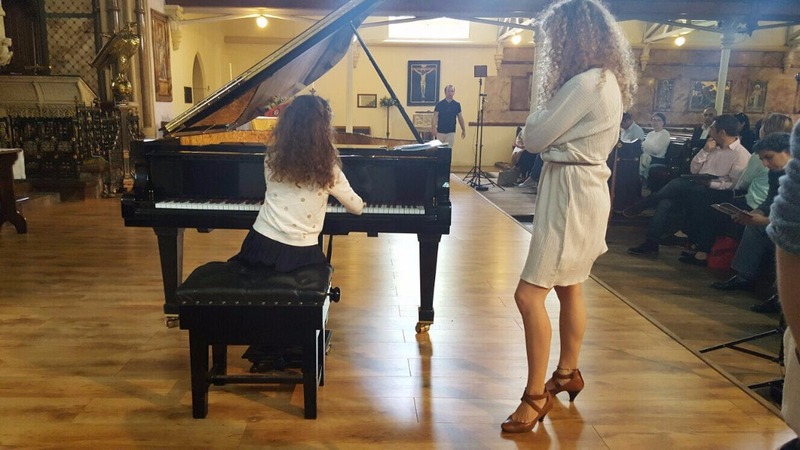 From simply introducing these works to adults and children, and those who wish to learn it, to different collaborations, combining music, art and dance, I have had the chance to share my project with my own piano students and schools. I had a beautiful workshop with the students of the Elizabeth Garett Anderson School, who, with their live enthusiasm revealed yet a new potential for engagement. We are now collaborating on the Vladislav Shoot Children's album, with illustrations from the students , to accompany the music. This accompanied me throughout my whole childhood journey. I have always loved this music, and with growing up have come to appreciate it even more, and how much it gave me in my musical education. Now as I continue to discover more in this music myself, it gives me a lot of joy to hear my students play it, and feel their evolving life journeys through playing it too. Its unexpected twists and turns, unique harmonic and melodic language, make it unlike any other children's music I have ever encountered, and I feel truly blessed to be able to share this with the world so that finally more people may hear it, and benefit from it as much as I did. Thank you so much for your contributions and participation, helping me share this music with the world. I am humbled and grateful to be bringing this project to life. Here is a little video with a short dive into a Sad Dream, This is one of the many scenes that will be recorded for Music Box. I am so touched by your generosity and support. Thank you so much for your beautiful contributions towards my new album and for being part of this journey with me! Don't forget to send me your address and let me know if you would like to receive the special gifts upon its release. So far we have Earth, Fire, Water, Thunder, Lake, Mountain and Phoenix selected! Please share this with anyone you think may be interested to help in its realisation. Any amount, however small/or not included in the gift elements, does make a big difference in the long run. As a dear friend wrote today upon sharing this , the old proverb - every drop of water makes the mighty ocean. I will be posting updates towards the making of Music Box, and sharing its journey with you. you will receive from me a signed first copy of the CD "Music Box"
you will receive 1 autographed copy of the CD "Music Box" and 1 special card with the artwork of Irina Shoot. you will receive 2 signed copies of the CD"Music Box", and 2 special cards with the art work of Irina Shoot. I will send you a Beliaeff edition score of Shoot's Children's album, 3 signed copies of the CD Music Box and a handmade card with artwork by Irina Shoot. I will give you/a person of your choice a piano lesson.You will receive 3 signed copies of Music Box AND a special print with artwork by Irina Shoot. Your name will be written in the CD booklet.You will receive 2 piano lesssons,5 signed CDs,3 handmade cards & a limited edition print of artwork by Irina Shoot. I will share a concert for you&your friends at a venue of choice.Your name will be written in the booklet,you will receive 5 CDs& limited edition CANVAS print.